The Northwave Extreme RR is made with Xframe® patented construction and ultralight next generation materials that are only 0.5 mm thick, the upper transfers every watt of power and provides the snuggest, even fit with no pressure points. It includes two footbeds with a stiffened dual density design: Standard Volume and High Volume, which features an extra 2 mm toe insert for narrow feet. The shoe is compatible with the NW Speedplay adapter for the lowest stack height between foot and pedal. The adapter is not included in the scope of supply. Speedplay Adaptor (not included in the delivery): The shortest distance between foot and pedal on the market. Northwave developed and patented, in collaboration with Speedplay, an exclusive adaptor that provides maximum power transmission on pedals, thanks to the reduced thickness of just 0,5mm rather the 3mm of the traditional Speedplay adaptors. Made of nylon with a thin aluminum plate (it saves 8,5gr) it allows to respect the natural anatomy of the sole keeping minimized the distance between the foot and the pedal in any position. Without adding bulk and weight as it occurs in systems without the adaptor. Ultralight Carbon Sole: Ultralight Carbon 15 sole made of 100% unidirectional carbon combined with a reinforced layer. 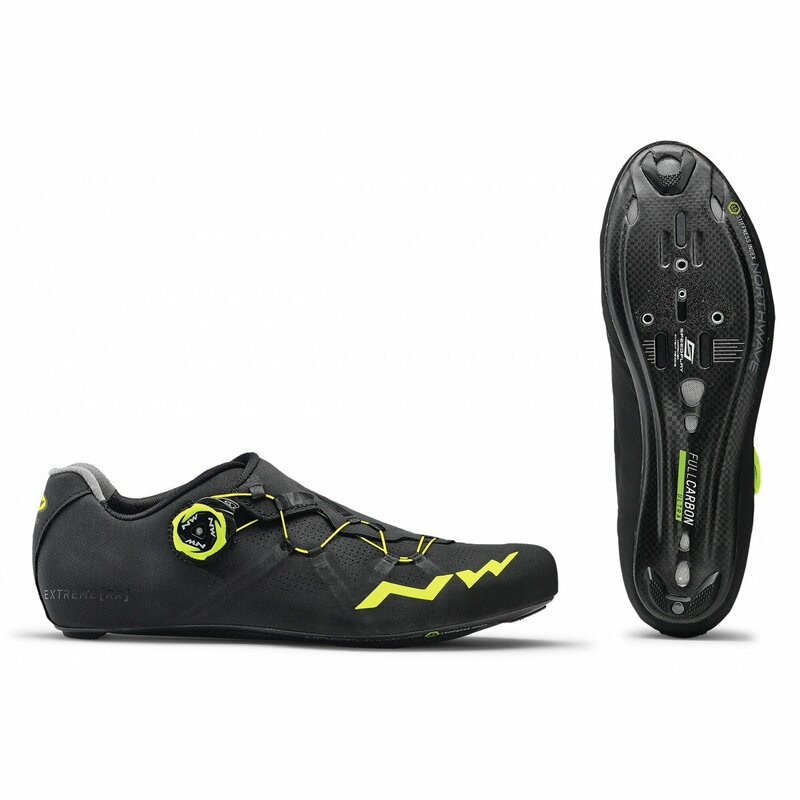 With a stiffness index of 15.0, it's the bestperforming Northwave sole ever. Integrated heel system: Integrated heel system containing directional fibre prevents any slipping. S.L.W. 2: Maximum precision and usability. The side button offers dual functionality: press the button for micrometric release, or lift the button to instantly undo the shoe completely. The ergonomic shape of the ratchet base matches the shape of the foot for added comfort, while the size and minimized weight plus the outer soft-touch covering make it easier and better to grip. It features wires that harness the best technologies used in sailing, and can be easily replaced using the spare parts kit. Regular Fit: Tests on hundreds of feet and countless trials have created the perfect shape for transferring 100% of your power straight to the pedals. The toe is designed to be just the right size to prevent any numbness, while the slightly set-back instep and the special snug-fitting design of the heel hold the foot in place during every pedal stroke and prevent any slipping.